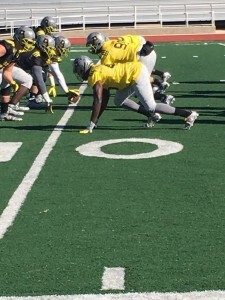 We’ve got more news and notes from Day 3 at the Army All-American Bowl in San Antonio. Plus, our Daily Dose with Chris Hall. More on Mark Jackson from our Joe Cook; the father interview : Jackson continued to have another solid day of rushing the passer. Like I’ve repeated at what might be an annoying level now, he lived in the backfield again today. He continued to use not only his striated glutes, but his strong hands and great use of leverage. Texas commit DeMarco Boyd officially official today. More from Justin Wells.